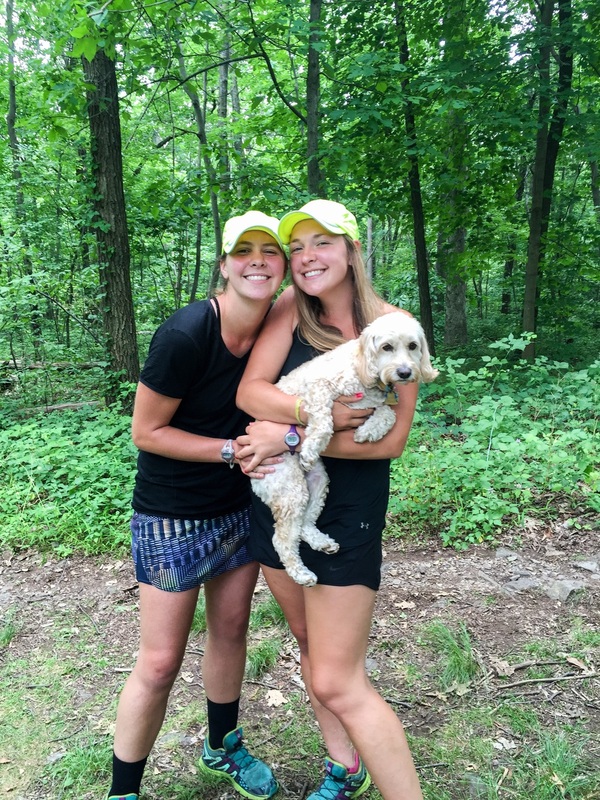 Bella joined us on the Appalachian Trail! 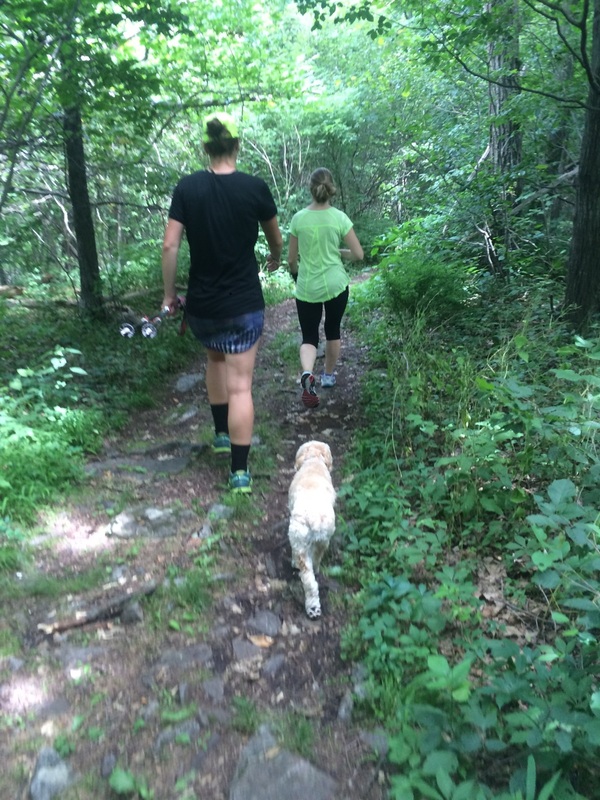 My parents drove down during the weekend of the 4th of July and slack-packed us for a quick nine mile section. I had been SO excited for her to come but as soon as she arrived, I was so nervous for her to hike. She might look and act like a puppy but she's eight years old! Bella's age isn't something I usually like to discuss but nine miles is a lot! That being said, she did fabulous. I was worried about her little paws on all those rocks but she seemed to manage better than I did. I tried carrying her in my back pack for a little bit because she seemed tired and I thought it'd be adorable, but she hated it. I carried her for a half mile section that involved a lot of Boulder climbing. I'm sure she could have done it, but I was really concerned about snakes creeping out from under the rocks and biting her. Also I couldn't bare to see her slip. As you know, Danielle and I #canteven with the PA rocks. So, in order to cope, we look for every excuse to get off the trail- even just for a bite to eat. Morale boosts are key. 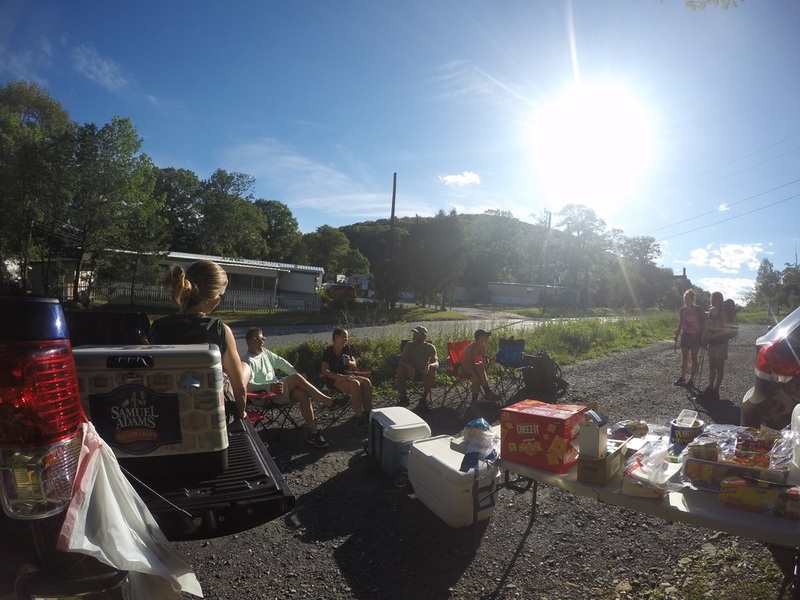 The trail passes through many towns in Pennsylvania, so beer and restaurant food is very accessible. One evening, we ate overpriced mediocre food at a trail side B&B and it actually made our day. Another afternoon we hitched into town to get a XL pizza. I think this was the first time we actually couldn't finish a pizza together. While we were in the plaza, we also hit up Marshalls because "we miiiiiight find something we need". I also bought bright pink Essie and painted my finger and toe nails. If I can't see the dirt under my finger and toe nails, it's not there. All about the morale boosts. Yes, this is part of the trail. It's called "knife's edge"
Aside from my parents visiting (see trail angels below), the best part about this week was finishing Pennsylvania! BYE, PA!!!! See you never. The water situation in PA is pathetic. Danielle developed serious "water anxiety" and practically breaks her back carrying as much water as she possibly can. It is truly magical when road crossings have water and sodas. We get so dehydrated in the heat and the beverages that kind people leave for thru hikers is actually a life saver. 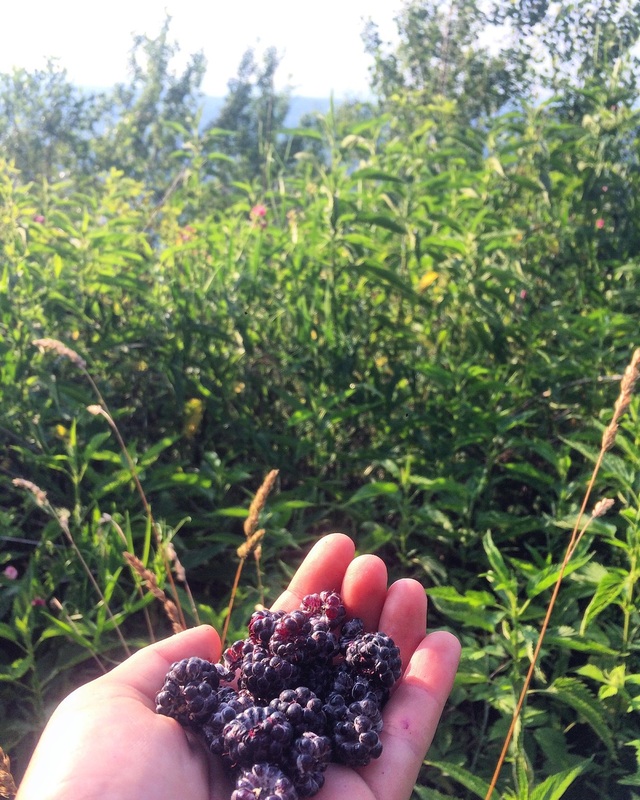 Upon leaving Palmerton up a treacherous Boulder jumble, Danielle and I were rewarded with the most incredible blackberry bushels. The berries were huge! It was amazing. 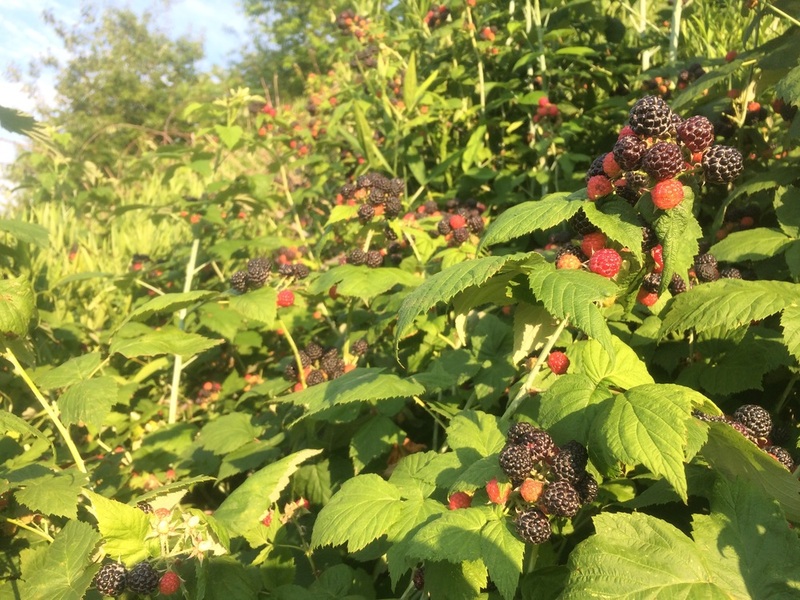 I must have eaten 100 black berries. My parents visited us on the trail! It was the best ever to see my dad and Bella for the first time in 3 months. And of course, I'm always missing my mom even though I saw her less than a month earlier in DC. My parents came prepared with a truck load of beer, Gatorade, hotdogs, chips, watermelon and other snacks. Greg was in his element grillin' dogs, talkin' trail chat, makin' friends. My mom was so happy to be taking care of other hikers and made sure everyone picked up a new tooth brush and toothpaste and filled up on water. Bella was anxious and scared of everyone but she was totally thrilled to see me. After a lovely night in a hotel, my dad took our packs while my mom, Danielle, Bella and I hiked nine miles to meet him at the next road crossing. When we arrived, Greg was beaming- beer in one hand, hot dog in the other. He had made friends and combined trail magic with another group. Tons of hikers enjoyed tons of food and it was really cool for my parents to experience part of the trail culture. I was SO sad to see my parents go, but their lovin' got us through the last few miles of PA and into NJ. The water situation was definitely the bummer of the week. It was so hot, so carrying extra made you sweat even more and need more water. It's an endless cycle. There was a 28 mile section without water. Aka Danielle's hell. She carried like four liters and for some reason, I only carried two. Maybe it's because I'm so stubborn, but all of a sudden I was the most thirsty ever (probably because I knew I only had two liters to last me for the next day and a half). I accidentally drank all my water before bed. I neeeeeded it. In the morning, we had 16 miles before meeting my parents. I crushed 12 miles and felt fine- it wasn't too hot out. I felt like my audio book mentioned tea or some other beverage more frequently than other mornings. Anyways, I got to a log to take a break and Danielle gave me her water bottle. I promised myself I wouldn't complain or ask for water because I had planned poorly and exhibited poor self control. But Danielle insisted I drank some water and I LOVE HER!